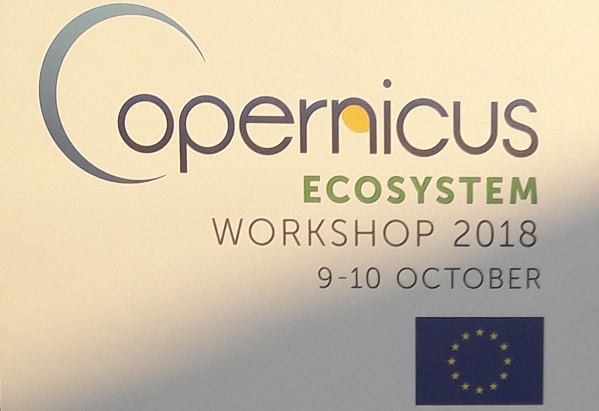 Last week I was in Brussels at the Copernicus Ecosystem Workshop 2018 which took place on the 9th and 10th October at the Docks Dome; an architecturally interesting building located on top of the Docks Bruxsel Shopping Centre. The event opened with a keynote presentation from Phillippe Brunet, Director from the European Commission’s Directorate-General for Internal Market, Industry, Entrepreneurship and SMEs (DG-GROW). He reviewed the progress of the Copernicus programme and highlighted the importance of Earth Observation (EO) data to understanding what is happening on our planet. His most interesting statistic, for me, was that the EO downstream market is growing eight to ten times quicker than the economy as a whole. Phillippe was followed by his fellow DG-GROW member Matthias Petschke who described the progress made within the Galileo project including the new EU regulation that, from 1st April next year, every new car will need to have a Galileo enabled device fitted. He also mentioned that most smartphones are also Galilio enabled and it’s possible to switch phones over to Galileo positioning. However, despite a number of us looking at this no-one could work out how to do it!! The major challenge for farmers over the next decade will be data led! Lots of new commercial applications, mainly from SME’s, offering a variety of AgriTech options including visualisation tools, augmented reality, artificial intelligence and automated solutions. It was recently confirmed by the European Commission that EO data can be used as part of the evidence for farmers to use within the Common Agriculture Policy which should reduce the need for farm field visits. Farm Sustainability Tool for Nutrients is a Copernicus based European Commission led, and funded, mobile application that will be offered free to farmers across Europe to give details about soil quality, moisture, land details, etc. There was a lot of debate about whether this would impact the commercial developments from the SME’s we’d heard earlier in the day. Whilst the app developers were clear they would not be in competition with commercial suppliers, and would actually offer a platform for products to be distributed, it is hard to imagine that they will not skew the market given it will be free and will be directly linked to the funding arrangements. Any commercial application will need to add a significant amount of value to compete. The first day ended with a pitch session, presented by the European Commission and the European Association of Remote Sensing Companies (EARSC), where ten SME’s were offered the opportunity to pitch to the three hundred plus delegates, and Pixalytics was one of them! A few weeks earlier we’d applied for this opportunity through EARSC, although to be honest we did not realise quite what we were letting ourselves in for. The ten companies approached the pitch in different ways and it was fascinating to see the other SME’s and their ideas, products and services. We’ve been self-funded to date and so we’ve never had to pitch for investment, therefore this was a fast-track learning experience on this type of elevator presentation. We didn’t win, but we gained a huge amount of knowledge and insight into what a good pitch looks like. The event was won by the fantastic Lucy Kennedy from Spottitt Ltd, pitching their fully automated analysis tool for optimal positioning of solar and wind energy installations. 6 of the 10 biggest companies in the world are data companies. Public sector still accounts for 50% of the downstream market. Innovation is about combination, and successful companies will be looking to combine EO data with non-EO data to develop new products. Questioning why the venture capitalists within Europe are not investing in space at the same rate as compatriots from the USA. Need to look at new sustainable business models – I particularly liked his example of the Danish gym which requires you to tell them how often you intend to go when you sign up, the gym is then free if you go but a charge is made every time you miss a session. Space people often talk to space people, which was effectively happening at lot at this conference, how we’ll grow is by talking to non-space people! 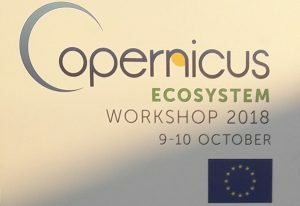 Overall, this was an interesting and thought provoking event, which will contribute to the strategic and operational discussions within Pixalytics in the coming months and years in terms of how we can develop and grow a variety of ecosystems within our local community, Copernicus and Earth Observation industry as a whole. This entry was posted in Agriculture, Business Innovation, Copernicus, Data, Earth Observation, ESA, Growth, Remote Sensing, Research, Satellite, Sentinel, Service, Space Industry, UK Space Industry, Understanding Space, visualisation and tagged agriculture, Agritech, Brussels, Common Agriculture Policy, Copernicus, Copernicus Ecosystem Workshop, data, DG-GROW, EARSC, Earth Observation, Ecosystem, EO, European Association of Remote Sensing Companies, European Commission, farmers, Galileo, pitch, pitching, pixalytics, Spottitt Ltd by Andy. Bookmark the permalink.